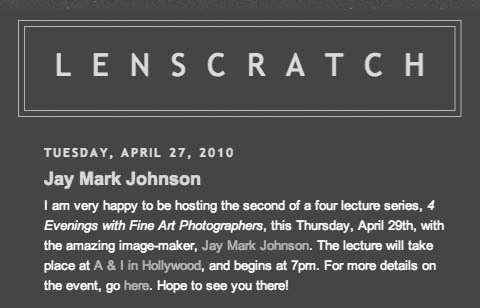 I am very happy to be hosting the second of a four lecture series, 4 Evenings with Fine Art Photographers, this Thursday, April 29th, with the amazing image-maker, Jay Mark Johnson. The lecture will take place at A & I in Hollywood . . .
LENSCRATCH | JULIA DEAN PHOTOGRAPHY WORKSHOPS | ALINE SMITHSON | View article here. I am very happy to be hosting the second of a four lecture series, 4 Evenings with Fine Art Photographers, this Thursday, April 29th, with the amazing image-maker, Jay Mark Johnson. The lecture will take place at A & I in Hollywood, and begins at 7pm. For more details on the event, go here. Hope to see you there! I am very happy to be hosting the second of a four lecture series, 4 Evenings with Fine Art Photographers, this Thursday, April 29th, with the amazing image-maker, Jay Mark Johnson. The lecture will take place at A & I in Hollywood, and begins at 7pm. For more details on the event, go here. Hope to see you there!I am very happy to be hosting the second of a four lecture series, 4 Evenings with Fine Art Photographers, this Thursday, April 29th, with the amazing image-maker, Jay Mark Johnson. The lecture will take place at A & I in Hollywood, and begins at 7pm. For more details on the event, go here. Hope to see you there!